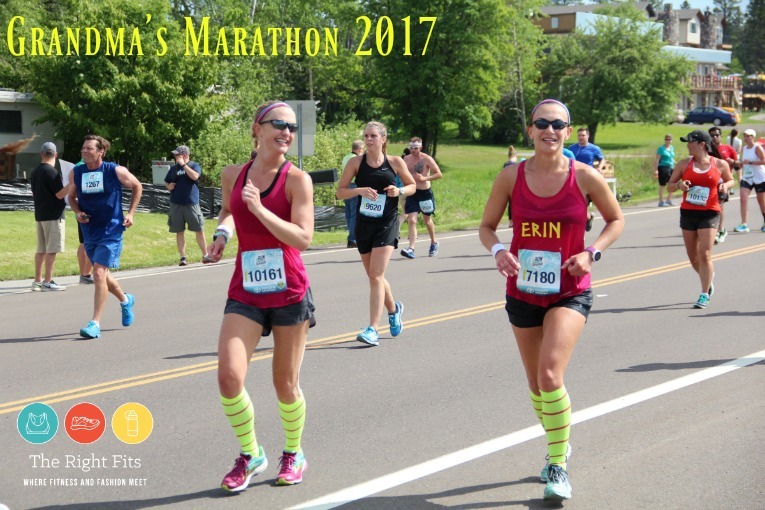 Last Saturday, I ran my 27th marathon, the 41st running of Grandma’s Marathon in Duluth, MN. This was my 3rd time running Grandma’s. I ran it in 2015. It was a downpour that year, but the rain kept us cool. I set a 13 minute PR! In 2016, I ran it again and it was a bust– red flag situation, super hot, not great. I ran a 3:49- a painful 3:49. Last year was definitely hotter than this year, but this year wasn’t great for marathoners either. There are definitely people who can run well in the heat, but I am not one of them. Neither is my sister, so she was a little psyched out by the forecast. We tried to stay positive as race day approached. We arrived in Duluth on Friday around noon and went to Subway for an easy lunch. Then we stopped by the expo, which was not too crowded at that time. I received a hooded sweatshirt for participating in the Grandma’s Challenge (the 5k on Friday night followed by the full marathon on Saturday). Other than the hoodie, however, there was no additional “bling” for doing the challenge. Other than picking up that and our bibs/packets, it was a quick visit to the expo. 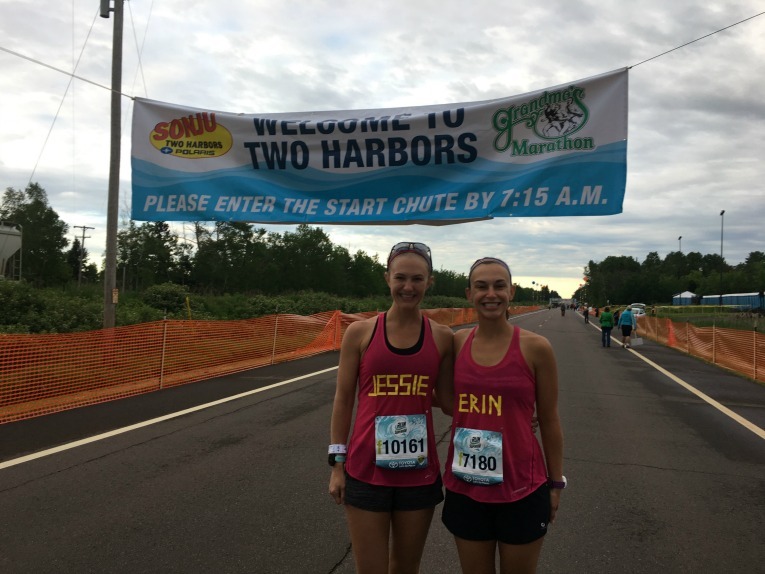 We were back at our hotel by 2 pm, where we relaxed, watched some TV, read books, hydrated, stayed off our feet etc., until it was time to head to the start line for the William A. Irvin 5k! We were staying at the new Pier B hotel, which was really lovely. We could walk from Pier B to Canal Park, where the 5k start and finish line were located. Dustin and I did about a 1.7 mile jog to warm-up before the 5k; it was a HOT and sunny evening- didn’t bode well for the marathon the next day. The 5k started at 6 pm. Since I was only doing it as a shake-out run, I had to keep reminding myself to hold back; it was hard not to get caught up in the race vibe! I averaged about 7:45 min/miles which is much faster than a normal shake-out run. After the race, we changed into dry clothes (we were super sweaty just from the 5k- so hot!) and went to the pasta feed in the DECCA convention center. It was $12/person for pasta with/without meatballs, bread/butter, a salad, and ice cream if you wanted it. It was basic, easy, just what we needed the night before the marathon. We headed back to the hotel to shower and relax for an early night before the marathon. Race morning, I ate a plain bagel with peanut butter and extra salt. I also mixed up a serving of Gen-U-Can in a disposable water bottle. 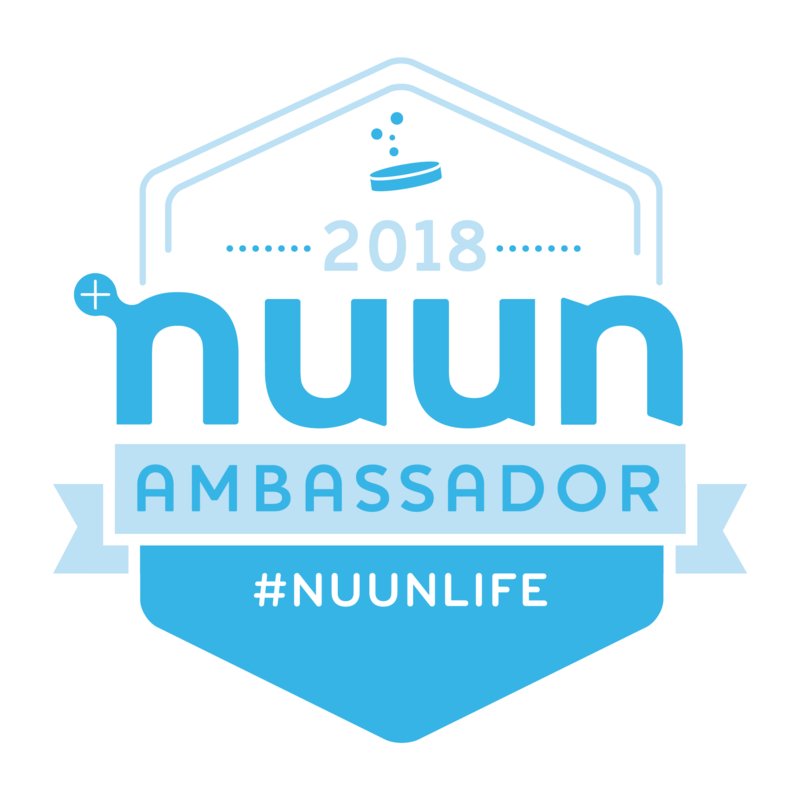 I hadn’t trained with Gen-U-Can since last year’s Grandma’s Marathon, but I knew it was easy enough on my stomach, so figured it wouldn’t hurt me, especially since I wasn’t “racing.” I might start fueling with Gen-U-Can again though, it worked pretty well! Before the race, I also drank a cup of coffee, Gatorade, water, and ate a few GU chews. We stayed at the new Pier B hotel. 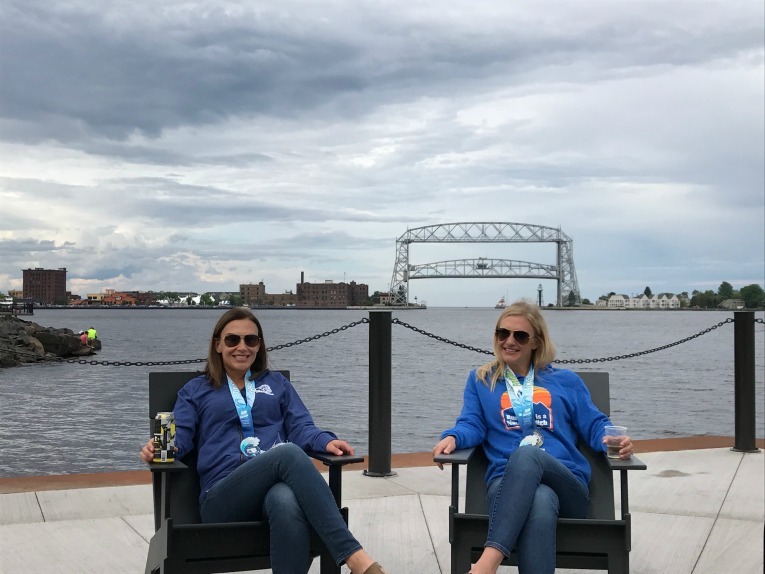 It was a little pricey for Duluth ( marathon sur-charge! $400/night, 2 night minimum), but the location was good and they did a lot of great things for the runners; there was breakfast available in the lobby on race morning (bagels, bananas, water, coffee, tea, peanut butter, hard boiled eggs). There was a shuttle to take us from the hotel to the spot where we caught the buses to the start line, and post-race there were ice packs and snacks in the lobby. We arrived at the start line VERY early; earlier than I ever had before. We were probably the first ones to use the porta-potties, so I guess that’s good! We got the freshies. We settled in to wait on a spot on the grass for awhile. We were happy when it started to rain- I thought that meant it was going to stay cool! I had packed two ponchos in my gear bag so we were just fine. But the rain only stuck around for about 10 minutes before the sun came out and it was hot again. We lined up in the race corrals around 7:15, for the 7:45 start. The announcer was kind of funny; he kept talking about the runner last year who got hit by a rogue deer that jumped the fences! 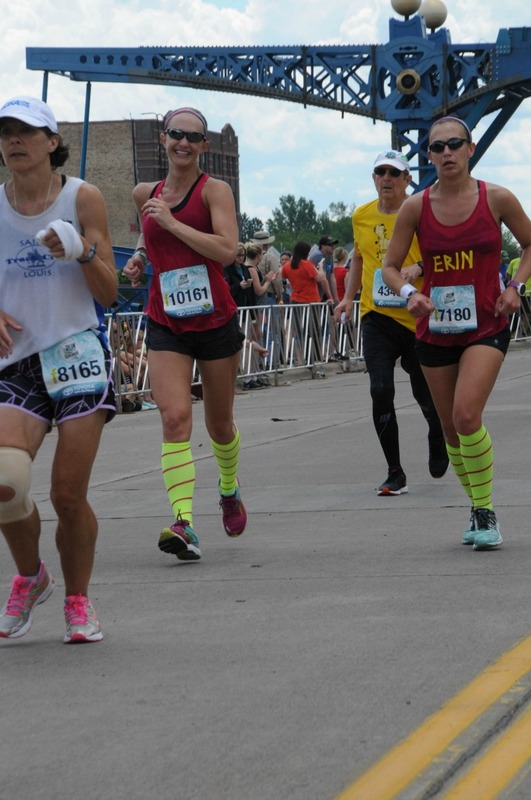 That runner was back again this year, basically a Duluth celebrity! I could tell Erin was nervous as we waited in the corrals. There was a woman near us doing jumping jacks…who does a warm-up before a marathon? A warm-up might make sense for the elites, but I never do a warm-up for a marathon…maybe I should? Maybe she’s on to something! Before we knew it, the gun went off and we were shuffling our way to the starting line. We probably crossed the start line mats 2 -3 minutes after the gun. Not too bad. There are about 8,000 runners in the full, so a nice medium-sized field. The first three miles were pretty uneventful. Erin wore a bracelet she had made with her fueling plan (i.e when to take her Huma gels, Gatorade vs. water, salt tabs, etc). I didn’t have as much of a strict plan, but I think I fueled about every 45 minutes with the GU’s I brought along. I also took the GU they handed out at mile 17, as well as any and all oranges and frozen grapes along the way! Those are always a win for me. Side note- this race does all it can to combat the hot temps: sponges, ice, aid stations nearly every mile, sprinklers, and more! I know how easy it is to get caught in your head…She was letting the negativity take over. No, no, no Erin! We weren’t quitting at the half! I reminded Erin that she didn’t come all this way to Duluth to quit at the half. I wasn’t there with her to run a half. I said that we’d dial it back a little bit pace-wise, but we were not going to stop. I knew that she could keep going. I told her that the marathon can be painful, but if you just keep going, the pain will pass; “You’ll feel better I promise!” It goes in waves, just wait for it to pass. Tough it out. Mile 10: 9:39- she even picked it up! 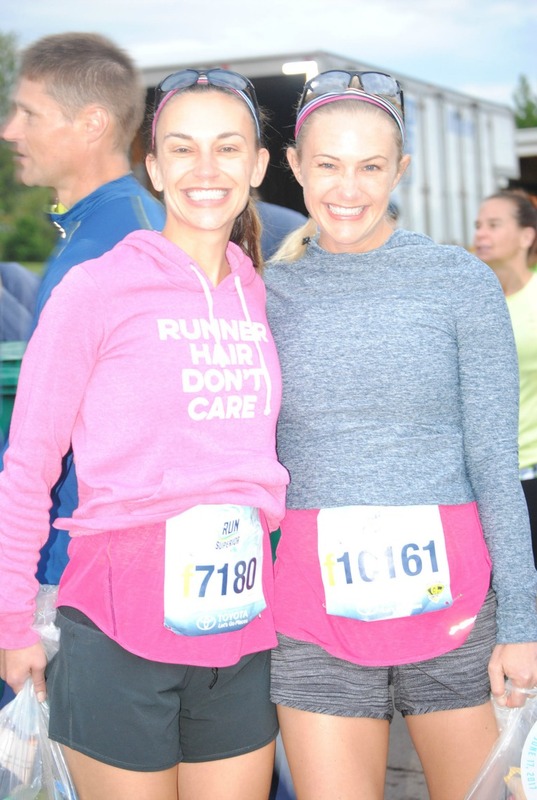 There are definitely people out there that can run well in the heat, but I think its my genetics (and therefore my sister’s genetics) that we can’t. The heat was really tough on Saturday. Mid-70’s and 88% humidity is not ideal for most runners and definitely not for Erin. And I totally know where she was coming from as I had just been through it two months ago at the Boston Marathon. Heat is HARD. And humidity? Even harder. I told Erin that if she were heading out for a long run, she’d probably say “oh, just 13 miles” and that was all she had left! 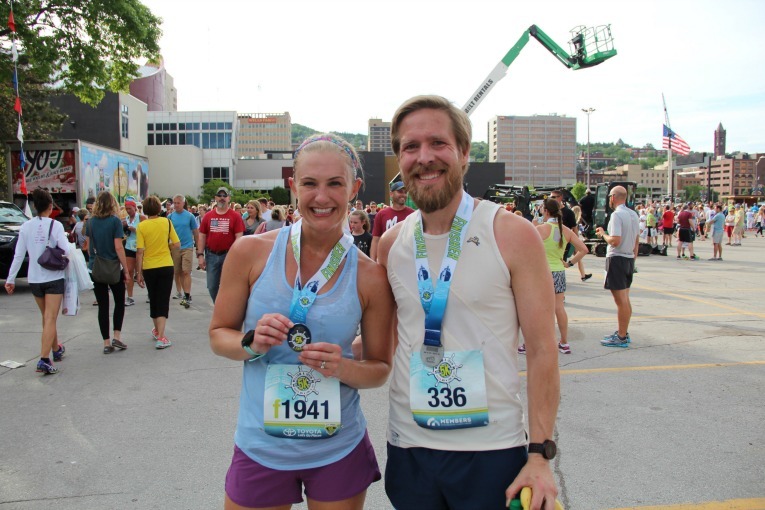 Not too bad….I knew she could run a half marathon. She knew she could run a half marathon. Mile 17: 11:16 <– one of the uglier miles. She was not in a good place here. But it passed! It usually does. I think this picture tells the story pretty clearly! 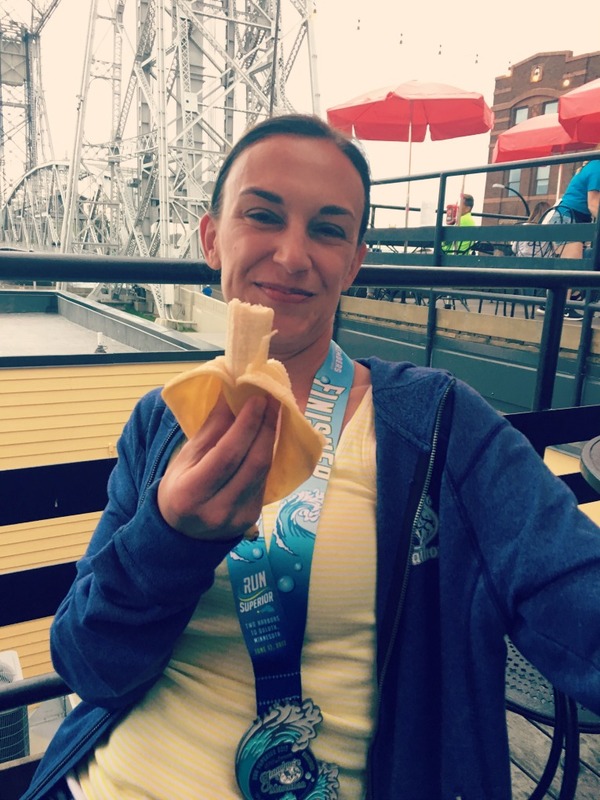 Mile 26: 9:43 – way to dig in Erin! She started to get REALLY angry around mile 24. She was swearing a bit about the elusive mile 25 marker. Where the f is it?? Now, I should tell you that my sister Erin is generally a very calm, level-headed person. She doesn’t usually swear. She’s a social worker by trade, a great listener, very even-keeled. 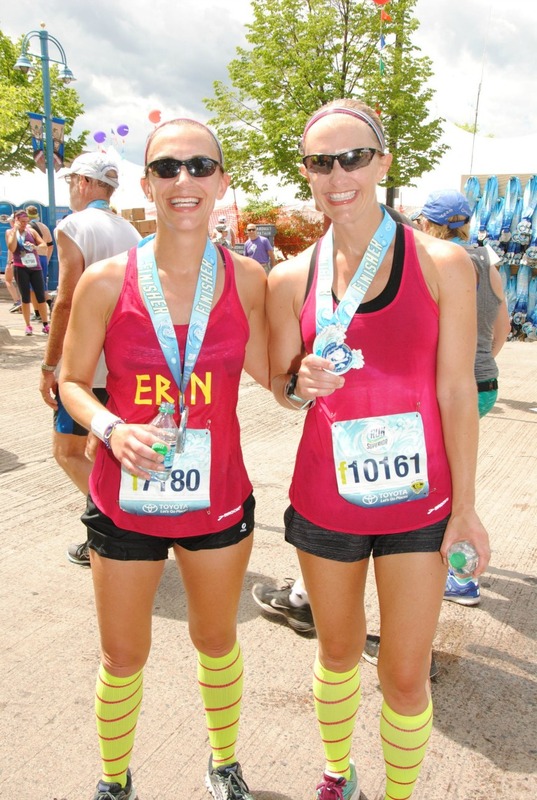 The “Mile 24-Erin” was NOT the Erin I knew! She actually yelled some profanity at this point at some innocent spectators who were just cheering her on. Oh, what a tough beast you are, marathon…such a fickle friend. 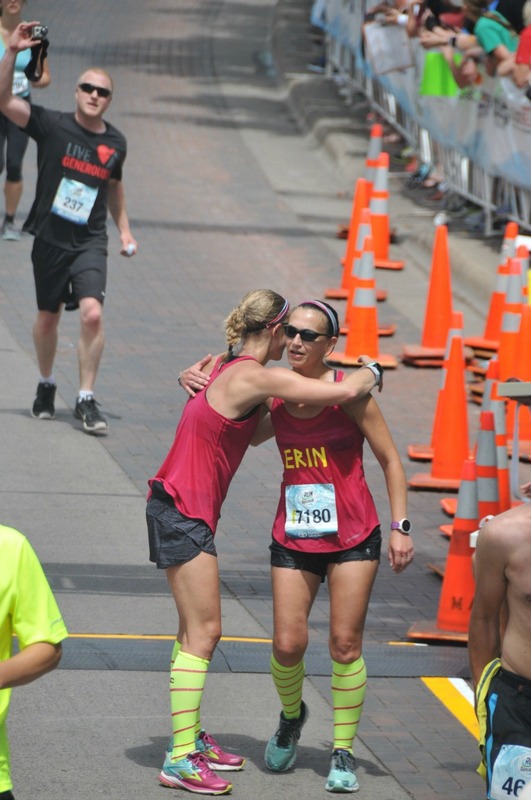 Now, we had planned to hug at the finish line for the insta 🙂 but man, that was the least reciprocated hug I’ve ever been a part of! I’d say that’s a one-sided hug if I’ve ever seen one. In her defense, she did say she was starting to get tunnel vision and right after we finished, she went into the med tent, to be treated for the side effects of the heat. The med tent volunteers were amazing and really helpful. Her case wasn’t anything too severe, but they cooled her down, gave her fluids, & monitored her blood pressure. She was in there for about an hour, so unfortunately she didn’t get to experience the ice bath of Lake Superior! I found Dustin at the finish, drank a few bottles of cold chocolate milk (I never drink milk, but it was super refreshing at that time). Eventually Erin was given the all-clear in the med tent. 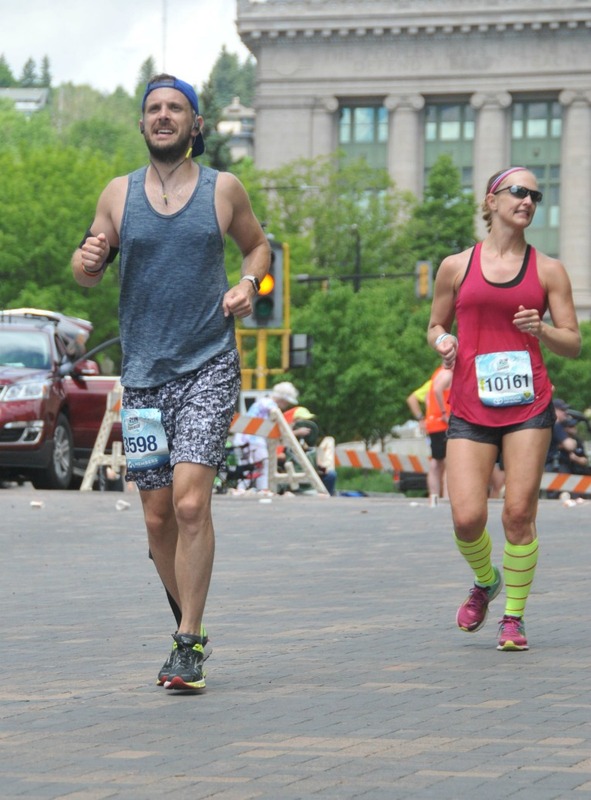 This was marathon #27 for me; I am VERY familiar with how crappy one can feel, so the rest of this post will be heavy-handed on the ‘motivational quotes’ but that was pretty much what I did at this marathon. Sure, I “paced” her, but it wasn’t really about keeping a consistent pace vs. keeping her head in the game. Relax your shoulders. Dial it back. You’ll be okay. Don’t’ think about OMG SO MANY MILES LEFT. Don’t think; just run. Other miraculous words of inspiration from me to her? Of course, as we hobbled back to Pier B post-marathon, it started to downpour on us. And of course, we got really cold. Where was this rain during the marathon when we needed it? Post-marathon, we all showered, ordered in some Pizza Luce, and took a little nap…eventually we were ready to head out to celebrate! We had a cocktail at Vikre Distillery and then joined our friends at Grandma’s Saloon- THE Grandma’s for which the marathon is named! Erin was still feeling a bit rough, even after a casual banana. Around 9 pm she and I walked back to our hotel, leaving Dustin out to celebrate with the young kids for awhile longer. Sunday, we had brunch at the Duluth Grill (delicious!) before hitting the road back to Minneapolis. Erin had a flight to catch back to Chicago. I know that I’m here saying that I’m done with Grandma’s for awhile because of the weather, but other than the heat, it really is a great marathon. I love how the whole town gets into it. The spectators and volunteers were phenomenal- so many people handing out fruit, candy, extra water, sprinklers, amazing! Way to go Duluth. The line of 80’s troll dolls around this same spot- so random! The USA-pride shirtless guy who took 3 shots and drank 2 beers..and then puked. The older gentlemen running by us who was doing his 100th marathon! The grandpa spectating in his lawn chair wearing a vintage 1986 Grandma’s Marathon finisher’s tee! The hula dancers around mile 25. Seeing so many random people I knew! I ran with J.C. from [solidcore] for awhile. He’s even in this official picture with me! Marathon 27 was a success in my book, and I think it was a success for my sister too. 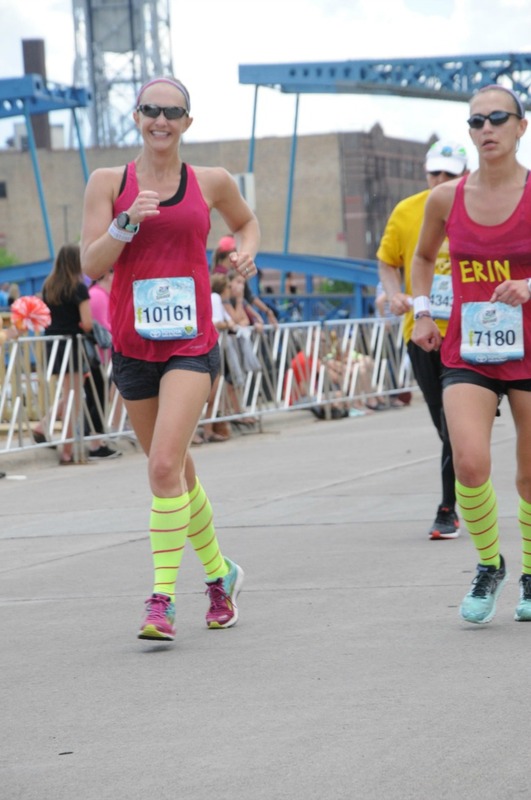 I really enjoyed running with Erin. She thinks I need to loan out my pacing skills to others, but I’m not sure I would be able to motivate people I don’t know. I’m much more comfortable pushing my sister (and getting yelled at by her;) it would be very different with a stranger! Next up: New York City in the fall! Between now and then, I plan to race the Raspberry 1 mile in Hopkins, the Torchlight 5k, and the City of Lakes Half Marathon in September. 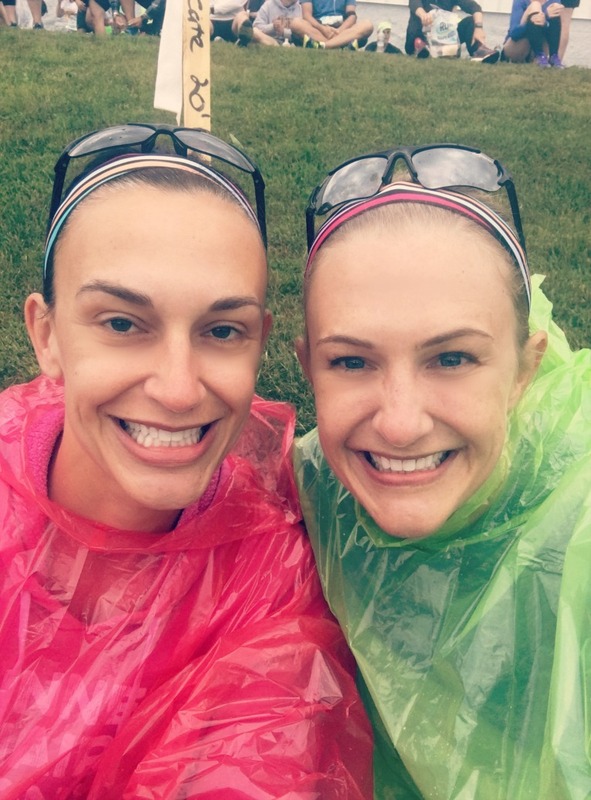 I’m also doing the Trail Ragnar race with my sisters (my first Ragnar). I’m sure there will be other races along the way as well. Let me know about your experience in Duluth- what were your highlights? How do you do in hot races? What are your mantras to keep you going when it hurts? 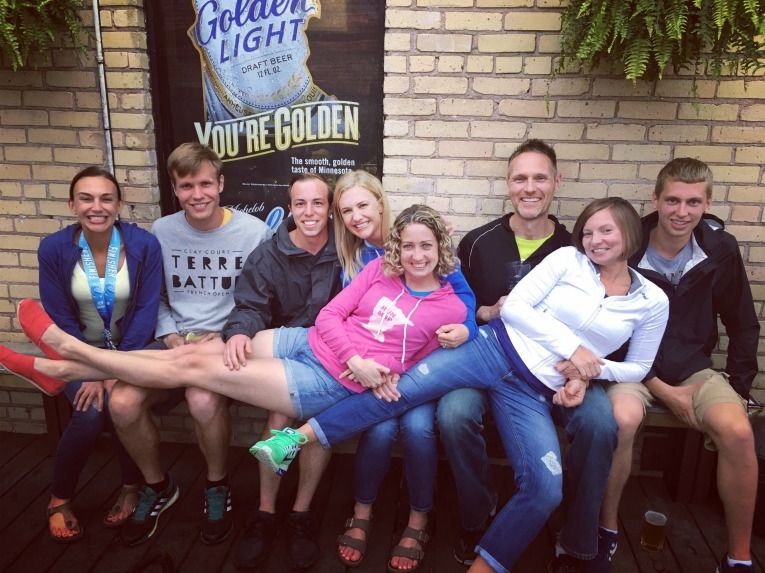 « Weekly Recap: Grandma’s Race Week! Awesome job keeping Erin going!. I could’ve used you as a cheer leader at Boston. I agree some people are just made for heat and I am definitely not one of them either. Congrats to Erin for toughing it out. Those few people who can perform on a hot day amaze me…I would like to see a study on what’s different about them- do they sweat less? Eat more or less salt? I’m so curious…. Boston is another example of a race that used to be cold and has been hot more often than not lately! Love this recap! My only marathon was Grandma’s 2013 and it was a 5:59 finish. Thankfully that was one of the cold years. Hopefully we get a few more of those in the future, because after doing the half this year I would like to attempt another full. I did post-race lunch at Northern Waters up on the hill, staying in the dorms is the way to go in my opinion. My husband and I had always stayed in the university apartments (so great to have a kitchen). This was our first time staying closer to Canal Park. It was really convenient to walk everywhere. I hope for cold Grandma’s in the future as well! “Where the f*&^ is the finish line!! !” is how I end all of my marathons too! Haha I suppose that’s true but most people don’t say it out loud!